Lots of content for the SMB audience includes a writer byline. While this is a great idea if the author is an expert from your company and a good idea if the author is an external industry expert, you really shouldn’t promote freelance writers in bylines. Why? First, SMBs don’t really care about bylines. 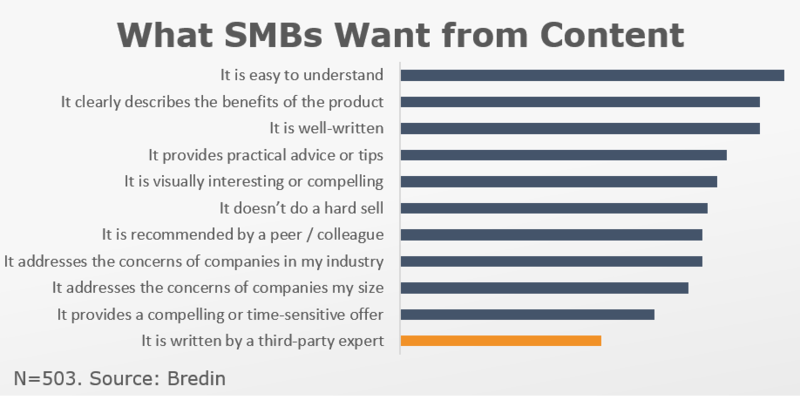 In recent Bredin research, SMBs ranked “written by a third-party expert” very low on a long list of desired content characteristics. It lagged behind “easy to understand,” “provides actionable advice,” and “points me to products and services.” SMBs judge content on how well it helps them solve a business problem. Second, using third-party bylines can potentially distract from your brand. For example, if you promote content that is written by a well-known third party, the expert’s name may take top billing, eclipsing your brand and diminishing your position as a “hero” or trusted advisor to SMBs. The solution? Use bylines from your own team. It’s fine to use outside resources to ghostwrite pieces for your internal team. Move your team’s byline and expertise to the forefront so SMBs give you full credit for your business-building advice. Need help developing great SMB content? Contact Bredin at info@bredin.com.